HootSuite is the lifeline of many social media pros. Not only does the service allow you to share to multiple social networks at the same time, it also lets you schedule your posts. 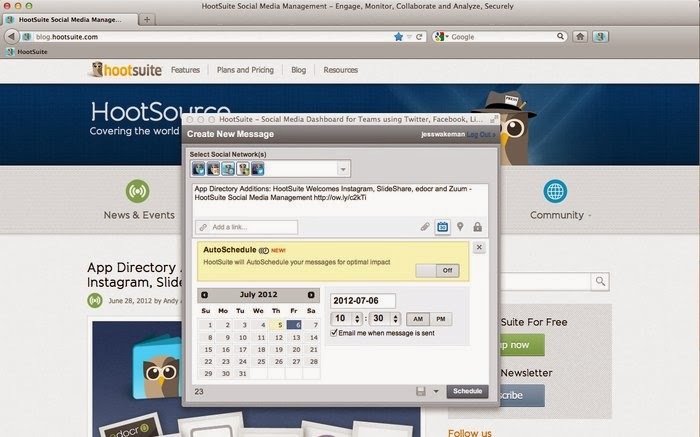 One of the best ways to make the most out of HootSuite is by installing the Hootlet. 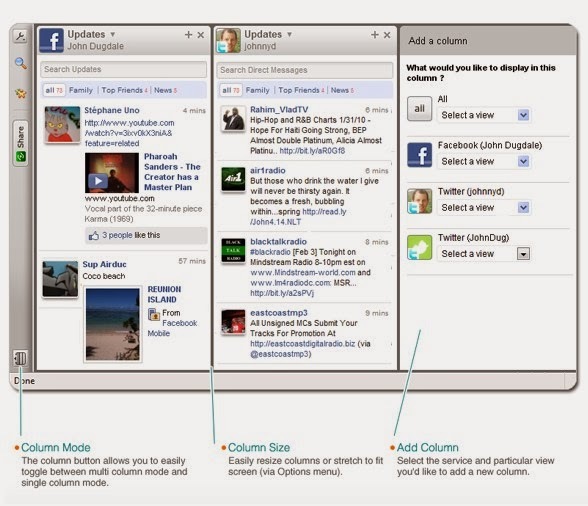 The Hootlet, once installed, enables you to share any page without leaving the current tab. Right from the same page, you can choose which networks you'll share the page with and when the post will be published. Another great companion add-on for HootSuite lovers is the Hootbar, which allows you to tweet from the address bar. Buffer is one of the best applications as far as social media management is concerned. We have so many profiles, be it Twitter, Facebook, or Tumblr, and it's often so hard to post to each and every network at the same time. Also, we come across so many new stuff that it is difficult to share all of it at once. 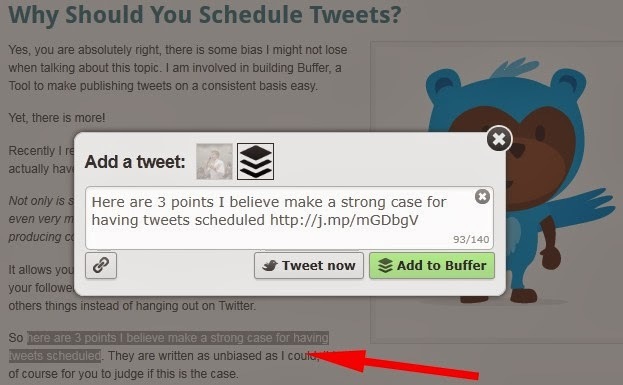 Buffer is a popular service that solves that problem by letting you "buffer" your social media posts to be automatically posted later to all of your social media networks. This not only saves you a lot of time, it also avoids making you look like a social spammer. It’s definitely worth trying out. Facebook Photo Zoom is one of the most useful add-ons for Facebook fans. If you use Facebook a lot, you must know how annoying it is to click on each and every pic to zoom it and see it. The add-on automatically zooms an image every time you hover it. 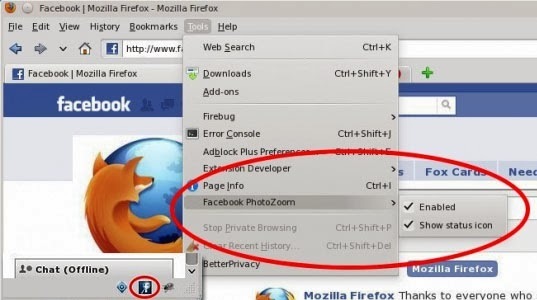 Simply place your mouse over a pic you spot on your newsfeed, it will automatically zoom. Once you leave the mouse, it will go away. 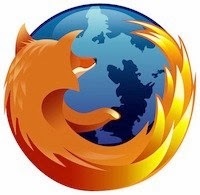 This official application by Twitter lets you integrate the social media site with Firefox. Once installed, you can search for people directly from your address bar. Furthermore, if you pin the Twitter tab on your tab bar, the Twitter icon will glow every time you receive new tweets. The integration is pretty straightforward and simple and it's a great way for a Twitter addict to use the site without bloating the browser with unnecessary add-ons. Yoono is a great Firefox sidebar for all IM as well as social media needs. Integrating perfectly with Facebook, Twitter, LinkedIn, MySpace, YouTube, Flickr, Yammer, AIM, and Yahoo IM, Yonoo lets you easily share links, images, and videos right from the page you're on. If you want to see the latest updates on your social media feeds, simply open the sidebar and you'll have all the information at your fingertips. Though a little old and clunky, Yonoo is a great choice if you want a fully integrated solution for all your social media needs. 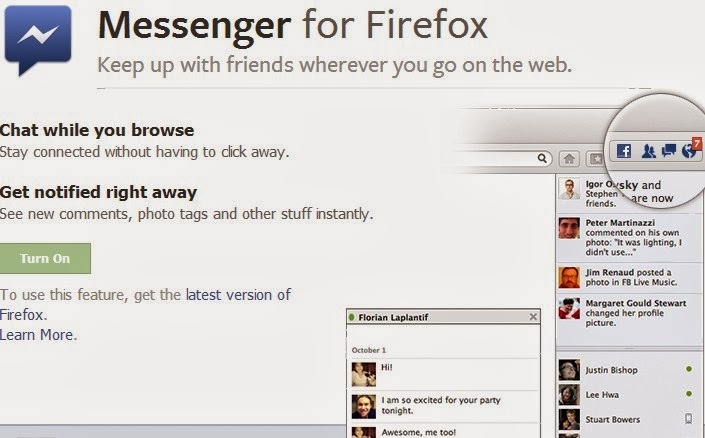 Facebook Messenger for Firefox is the most perfect application for Facebook addicts. Not only does the blend of Firefox and Facebook work seamlessly, it also helps you get rid of your constant nagging habit of checking Facebook to see if there's any new notification. With support for notifications built into your browser, you won't have to worry about the latest things happening on your newsfeed. Just install the app and relax, as Facebook becomes a part of your browsing experience.